On Wednesday, Etsy unveiled Etsy Search Ads, a new promotional tool for Etsy sellers. Sellers can purchase ads for their entire shop, or specific sections and items in their shop, based on automatically detected keywords. With the Search Ads forum thread overflowing at over 100 pages, there are plenty of concerns to be addressed. To answer some of the pressing questions about the new tool, we talked to Etsy’s Frank Harris. Frank Harris (hirefrank) is Etsy’s Product Manager of Search. Previously, he was a Senior UX designer at Google focusing on payments and commerce. 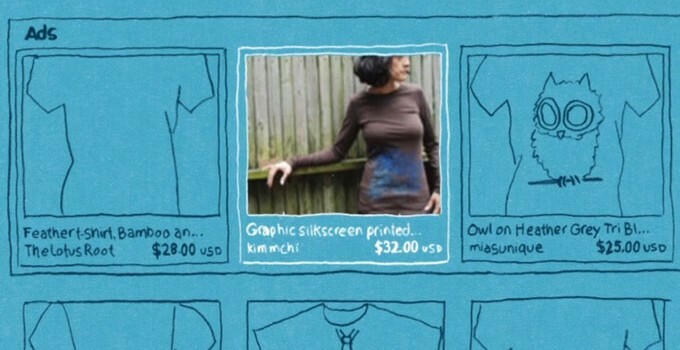 Etsy Search Ads suggests keywords – will sellers be able to create their own keywords someday? so we’ll be watching carefully to makes sure that Ads are effective for sellers while maintaining a good shopper experience. Search Ads currently only supports a single ad campaign per shop; many sellers would like to set different budgets for different types of items. Will there be an option for multiple campaigns in the future? Our goal in creating Search Ads was creating the most effective product for our sellers, that makes it easy and understandable for any seller to sign up. We designed the Search Ads system with this in mind, and we allow users to chose sections of their shops, or to chose individual items so they can customize which items they’d like to promote. Some sellers are reporting that their Top Keywords are not suggested, even though they’re in the titles and tags of the items and on the Etsy keyword list. What is your advice for these sellers? The Search Ads system works with a sophisticated algorithm to pick keywords, so we cannot guarantee that the words in an items tags or title will be in their suggested keywords. We recommend that sellers try out a wide range of keywords for at least the first full week of running Search Ads. They can always check out how the various keywords are performing on the Search Ads module of the Shop Stats page. Search Ads are impression-based (CPM). Cost-per-click (CPC) tends to be better for direct sales – why did you decide to do CPM? Etsy is a unique marketplace. After evaluation of our shoppers behavior, we decided that because many shoppers view items, put them in treasuries and favorites and share them with friends before purchasing, we felt that exposure was valuable to our sellers, so therefore we felt that the CPM model worked best for us. What can sellers do to turn impressions into clicks? As with all items on Etsy, we find that clear, high quality pictures lead to higher click-rates. Sellers are nervous about impressions being wasted on people searching to check their item placement, screen-scraping bots, people composing treasuries and other non-buying purposes. What measures has Etsy taken to reduce this concern? Treasuries are a great marketing tool, and inclusion in them often leads to more exposure and ultimately sales. In addition, some of our best buyers are sellers, so sellers should not be worried about impressions shown to other sellers. We have systems in in place to identify fraudulent activity, and if we suspect it sellers will not be charged for those impressions. Can you comment on keyword pricing? The help documents say that the price increases with the popularity of the search term. Sellers are finding it hard to believe when looking at a list where ‘starfish necklace’ is priced significantly higher than ‘necklace’. Are we totally off-base about which searches are popular? Etsy’s search technology sets keywords and prices based on Etsy sellers’ use and historical search data. One of those points is the popularity of the search, but others have to do with how many searches lead to purchases, average pricing of those purchases, etc. So it’s not as simple as which searches are most popular in terms of keyword pricing. We encourage sellers to try lots of different keywords suggested to them at first and to look at their shop stats to see which keywords performed best. Not all impressions are equal, and so sellers should not get hung-up on the prices of the keywords. They should look experiment with many keywords at first and look at which items and keywords are bringing them the most value and exposure over time. The Etsy Search team said “search is never done” with regard to relevancy search – that it will be continually improved and worked upon. Will Etsy Search Ads also be an ongoing process of improvement? What have you heard so far that you’re planning to address? Yes – Search is not done and neither are Search Ads! We have already started to address questions and concerns that sellers have about the product and will be looking very closely at the performance of Ads and shopper behavior as we start showing Ads on Etsy next week. One example of this – we are looking into showing a greater number of keyword suggestions to sellers so they will have greater control of when their Ads appear. A huge thanks to Frank for answering some of the biggest questions around Etsy Search Ads. Let us know what other questions you have in the comments, and check out my Search Ads FAQ for more information. Fantastic information! Is it necessary to repeat a word in a title to get better SEO results? Sue, thanks! Instead of repeating a word in a title, a better idea is to use another word with the same meaning. For example: Purple Napkin Rings, Plum Serviette Holders. You get the idea. It is a good idea however to repeat the words you used in your title in both your descriptions and tags. When repeating the key words in your descriptions, don’t just copy and paste your title into the description. You want to try to add these words into your description in a conversational manner. Best to make small changes and track to see what tweeks you made have a positive impact in your stats. Hope that helps!